← How do YOU define success? Chip shops and kama sutra: poetry with a difference, Glasgow-style! It has been some time since I last wrote about a wonderful local initiative bringing children, parents, our wider community and the Great Outdoors together in North Kelvin, Glasgow, U.K – The Children’s Wood, which very happily has recently gained charitable status. Everyone around here is delighted with this achievement. 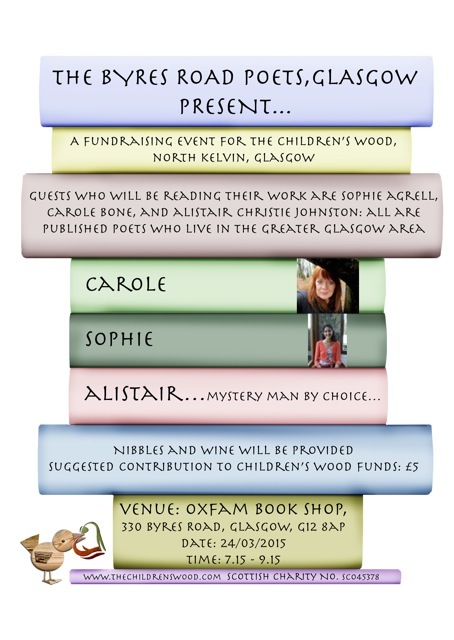 One of the things we can now do is extend our fundraising activities.To this end, The Children’s Wood is teaming up on Tuesday 24th March, 7.15 pm, with our excellent Oxfam Book Shop, 330 Byres Road, Glasgow G12, which is always willing to support appropriate local initiatives. That diverse and talented group of published poets from the Greater Glasgow area, the Byres Road Poets, are presenting an evening of poetry reading in the above shop to raise funds for The Children’s Wood. There will be wine, nibbles, and a chance to contribute a suggested £5 – or more, don’t hold back! – to The Children’s Wood‘s coffers. To continue with these imaginative existing initiatives livening up and enriching the lives of young and old alike in the North Kelvin area, we need funds. Do be generous – it’s a terrific, life enhancing cause. I know that my many loyal readers and Followers live in different areas of the UK and all over the world, but especially in the USA. Our local initiative here in one area of one Scottish city is an important microcosm of a world-wide movement to get young people, parents, and whole communities together, to get us OUTSIDE, to get us more active, less gadget-bound and therefore more healthy. So: those of you who are too far away to come and listen to those excellent local poets, why not give a donation – anything you can afford would be welcome – to help us on our way? Click HERE to donate. Many thanks! We are all part of the ONE: one family, one community, one nation, one world. Let us never forget this, and let us support one another in any small initiatives for positive change. This entry was posted in Health and Wellbeing (article archive), Poets - known and new and tagged Alistair Christie Johnston Scottish poet, Carole Bone Scottish poet, North Kelvin Glasgow U.K, oxfam book shop glasgow uk, Sophie Agrell Scottish poet, The Children's Wood, the Great Outdoors. Bookmark the permalink. Happy Spring Equinox! Did you have opportunity to see the eclipse? That would have been just marvelous. Equally marvelous is all this good news about progress for The Children’s Wood. The poetry reading sounds wonderful fun — I’d be there if I could, but that’s a mighty big pond to cross. I will send along a small contribution, though. It’s the least I can do for such a worthy cause. Thanks for highlighting the celebration! Linda, you are a star supporter! Thanks so much in advance for the contribution…pity you couldn’t be there to read us that fridge poem! Ah, this is the answer to a slow soul rot: ” get us OUTSIDE, to get us more active, less gadget-bound and therefore more healthy.” I’m not surprised that you’re part of a group that’s nudging others to awaken and stop sleep-walking through life! Thanks for that, Lisa! Perhaps we should start an international wing of The Children’s Wood. You and your artwork would fit right in! you are so right, and i thought that maybe your post was going to suggest that! hmmm, i suspect it could easily happen. so little internet time and quality for me.. that’s one of the two ‘problems’ of living where i live the other is all of the power outages – we were out for four days this week! i need to find a mini solar battery charger, and i’ll be fine without the power! I get the impression from your posts that the benefits far outweigh the disadvantages? The strong sense of being part of a vibrant community comes across strongly from your posts and images.